Here are some of our navy blue bridesmaid dresses, other styles can also be made in this navy blue colour (we call it midnight blue on our website). 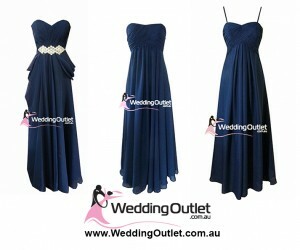 Navy blue is considered a royal colour and it’s very elegant when worn by bridesmaids. At the same time it’s slimming and suits brides that love the colour blue. All our bridesmaid dresses can be mix and matched in colour. So if you seen another styles that you like on our website, you simply choose ‘midnight blue’ under colours and it will be made in this midnight blue colour. Navy blue is almost what we refer to as our midnight blue colour.